We've started a project of building faction specific units for Battletech. We want to start with three companies (12 mechs) for each of the major factions of the Inner Sphere. Our plan is to make one elite company, one regular company, and one generic camouflage company. We've started with the Draconis Combine (House Kurita) and so far we have finished a company of "The Legion of Vega". My wife chose that company because of it's interesting background. We are currently playing a campaign based in Port Krin on Antallos. 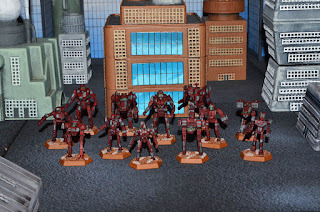 My wife painted this company using mechs from the Battletech Introductory boxed set. The new version of the boxed set came with nicer figures than the first printing. They are very clean and sharp in their detail. I've nearly finished painting a Sword of Light company and I also have about half a company of Draconis mechs painted in an Urban camo. I'm also hoping to have an armored company for each faction making a reinforced Battalion for each faction. After we finish the Draconis units we are moving along to the Federated Suns (House Davion). 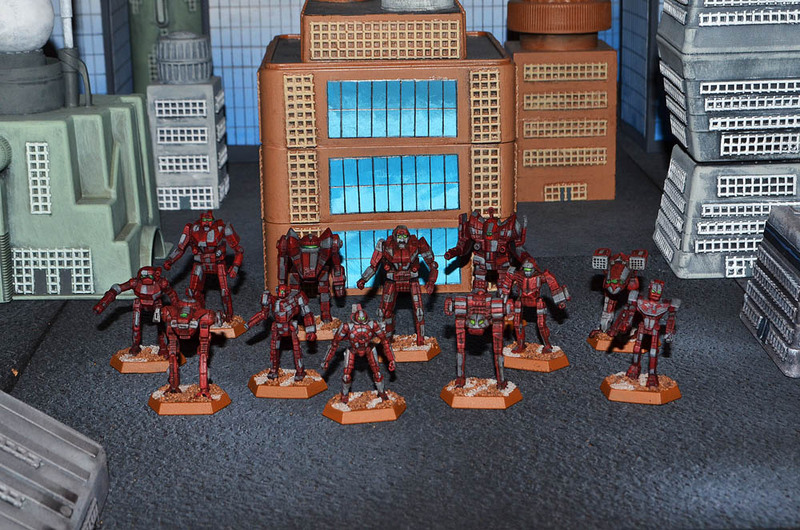 I already have a company of mechs started for that faction and another company on the paint table. Eventually I would like to do major Periphery states, invasion era Clans, Mercenaries and Pirates. In fact I have several small generic Pirate bands in the works. Really digging these battletech posts. $20 MSRP for the plastic mechs is not nearly as bad a price as the metals, and Alpha Strike has less paper work... might need a new game myself.